This course involves repairing, upcycling and potentially re-upholstering a small project of your choice. This could be any small piece of furniture that you would like to give a new lease of life. Examples of suitable beginners projects are dining chairs or bedside cabinets. You will have the opportunity to try out a range of upcycling techniques, formulate an upcycling plan for your project and then execute your plan under guidance. Suitable for those with no previous experience. If your project involves upholstery, please email us a photo for advice before you book your course. We use a mix of traditional and modern re-upholstery techniques in these classes and are happy for you to re-upholster items such as dining chairs and stools. If however your project requires more advanced traditional upholstery techniques such as loose hair stuffing, we recommend that you book into a traditional upholstery course such as those offered at the Bristol Upholstery Collective. 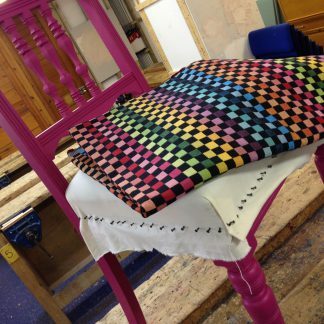 Furniture paints, waxes and basic upholstery sundries are included in the course fee. 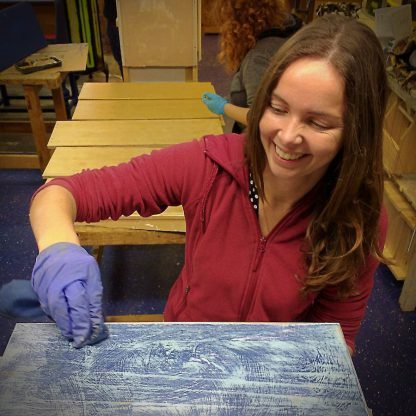 Off the roll upholstery materials such as hessian, calico, felt, wadding and top fabric will be available to buy at the Makershed in small quantities and as required for your project. You may also choose to purchase a top fabric independently and your tutor can advise you about what to buy when you make your upcycling plan. If you require foam for your project than we can help you order this from a local upholstery foam supplier. We strongly advise that you keep your project small and simple, especially if it involves upholstery. There is a maximum physical size limit of 60x60x120cm. You will have three days or six evenings to complete the project once you have tried out some of the paint techniques but due to the widely varying nature of projects and work speeds we cannot guarantee that you will complete your project in this time. For all unfinished projects, we are happy to arm you with advice to enable you to finish at home or to come back and rent a bench space at the Makershed.